Never Enough Nails: First Lynnderella Friday of 2016!! Happy New Year!!! I hope you had a fun New Year's Eve last night, whether you stayed home or partied til dawn! 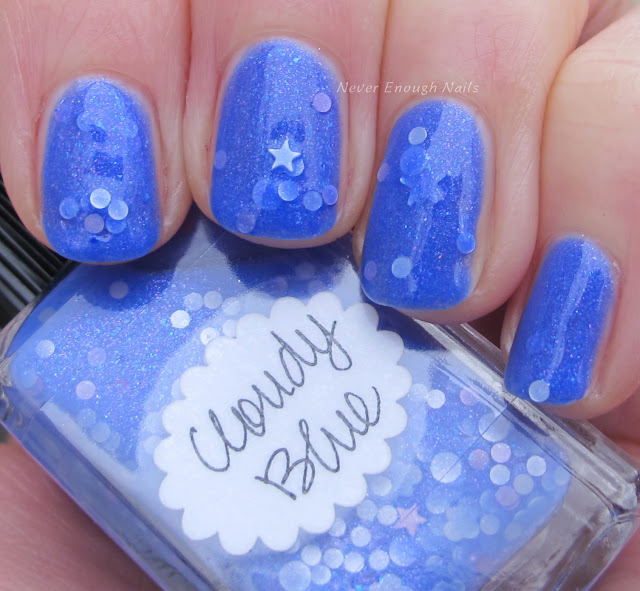 I have a pretty new LE Lynnderella for you today, Lynnderella Cloudy Blue. 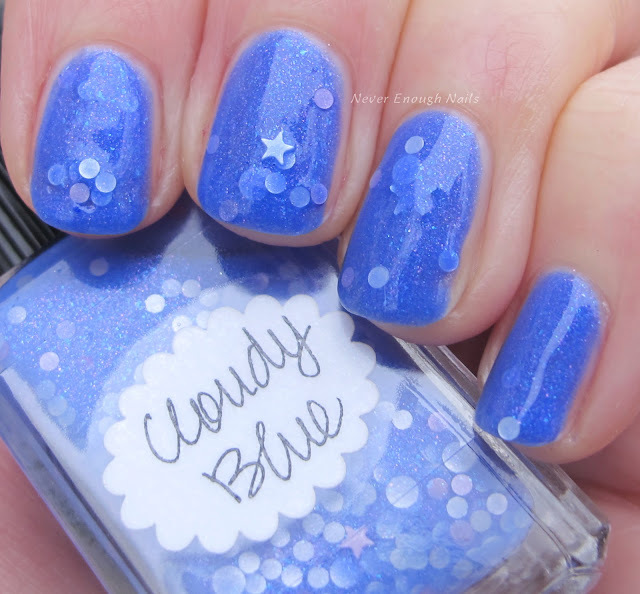 Cloudy Blue is described as "blue- and pink-shimmered translucent blue thermochromatic that shifts to clear when warm. 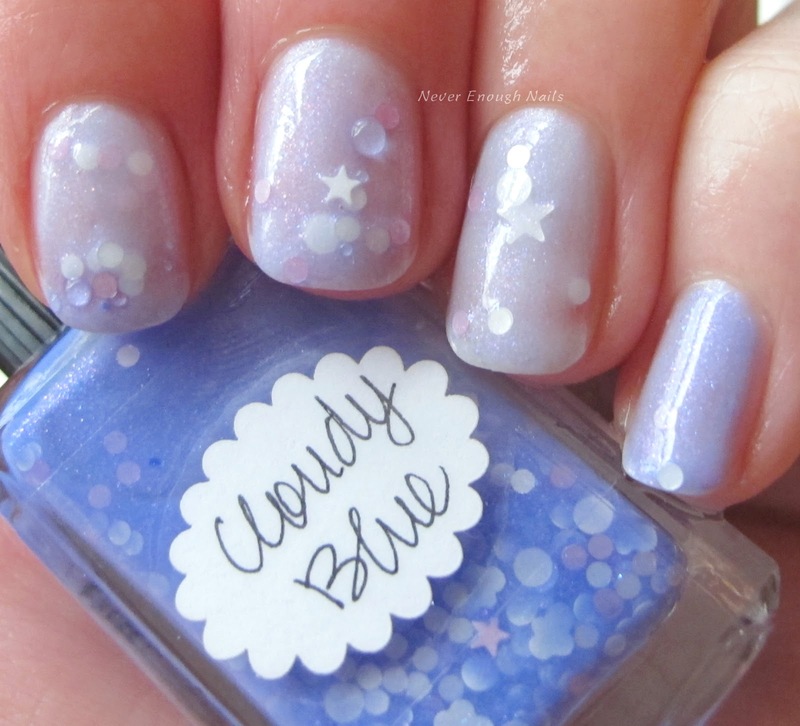 Featuring cloud, star and dot multi glitter.". 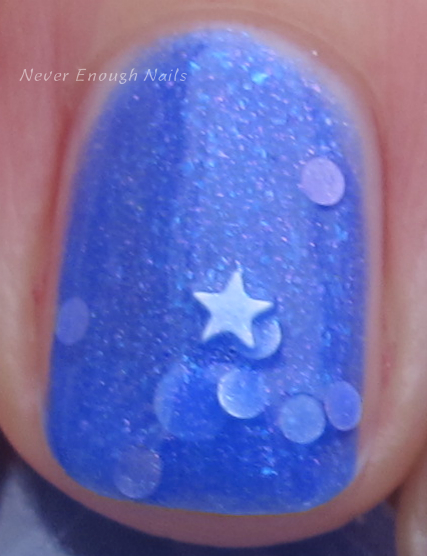 It is a kinda of squishy blue shimmery base, but I found it to build to full opacity on it's own. The mix of pink and blue shimmer in the base is very pretty and soft looking. I didn't get any cloud glitters out in this go round, but I didn't realize they were in this at the time, so next time I will pay better attention! This is two medium coats of Cloudy Blue on it's own. It was pretty easy to apply, although the glitter tended to get a little stuck together and concentrated in one area. So I know the description says that this shifts to clear when warm, but I found it to me more white when warm, which I actually prefer. It's actually a pretty opaque white too as you can see. I'm not a huge fan of polishes that shift to clear, as I hate seeing my whole nail under it, so I like that this is a nice shimmering cloud-like white. These lovely polishes are available on lynnderella.com. I know it has been a little quiet around here recently, but it will start to go back to normal now. I was pretty lazy on my vacation, but lazy time is coming to an end soon! !